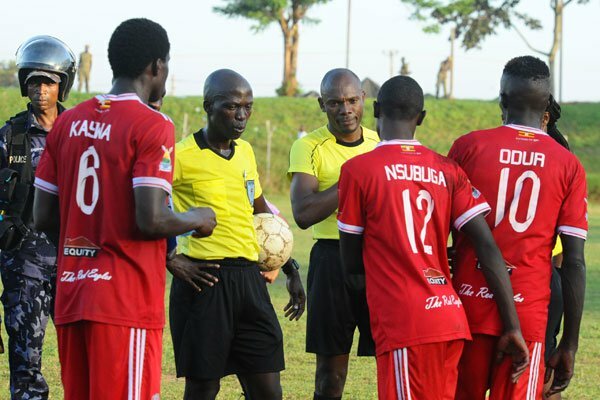 Uganda football governing body FUFA has today banned match officials following controversy around Tito Okello’s equalizer in the 1-1 draw between Vipers and Express at Wankulukuku. Okello’s strike late on came after Tony Odur had given the Red Eagles the lead from a spot kick and Daniel Sserunkuma missed a penalty for Vipers. The result helped Vipers stretch their unbeaten run to 24 league games and moved to 15 points, same as KCCA’s. Fufa released the statement on their website: “This is to notify all stakeholders that, upon the advice of the Referees Disciplinary Panel and the FUFA Referees Standing Committee, FUFA has banned three officials of match number 54 of the StarTimes Uganda Premier League played on Wednesday 7th November 2018 at Muteesa II Stadium – Wankulukuku. The 2nd Assistant Referee Mr. Kakembo Samuel is banned from performing refereeing services of all FUFA organised and sanctioned Competitions for a period of 5 years. The Centre Referee Mr. Kirangwa Ronald is banned from performing refereeing services of all FUFA organised and sanctioned Competitions for a period of 3 years. The 1st Assistant Referee Ms. Nantabo Lydia Wanyama is banned from performing refereeing services of all FUFA organised and sanctioned Competitions for a period of 60 days. The above decisions take immediate effect.